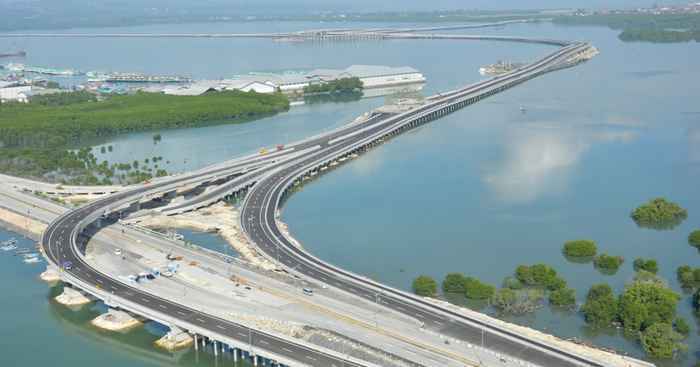 Bali toll road recently built on the sea, which connects the tourist area Nusa Dua, Benoa and Ngurah Rai Airport, is nearing completion, and can be used immediately before the APEC 2013 Summit in progress. The toll road is the first and one-on-one built on the sea. APEC 2013 Summit will take place on October 1 to October 8 2013. Bali toll road were originally planned to be built on land on the island of Bali. But getting a lot of resistance from residents of Bali. Because it is contrary to the customs and culture of Bali. And can interrupt the silence of religious activities in Bali. For all religious activities in Bali are not allowed through under any objects that are not sacred to the Balinese. Because appreciate and respect the local wisdom in Bali, baka government had the bright idea to build a toll road over the sea. Toll roads in Bali is actually made to unravel congestion during the activity of the APEC 2013 Summit, and other international events. In order for all international events in Bali can run smoothly and successfully without a hitch and significant disruption. Now the highway is made ​​above the sea in Bali has become a pride for the people of Bali in particular and Indonesia in general. Because it is a work of a very large and proud, which shows that the Indonesian people are able to make a stunning building, such as the Bali toll road. Bali toll road, connecting Nusa Dua-Benoa-Airport, can be completed in just over 14 months, faster than the original plan. This all proves that the people of Indonesia have adequate capabilities and technologies for the construction of roads and bridges over the sea. Actual construction of the toll road above the sea also have to sacrifice our environment around it. Such as the destruction of mangrove forests through which the highway lane. Therefore, the construction had to sacrifice some mangrove land and to bring equipment into the sea, to go through the mangrove forests at this point. However, it should be ignored, because if you want to get a good transportation system, we have to sacrifice a few things. As in the Development of the toll road, we had to sacrifice mangrove forests to obtain new transportation lines in the middle of dense population in Bali.